It's your holiday and all you want to do is relax, enjoy the scorching Portuguese sun and take a nice cooling dip in the pool. And who can blame you? Relaxation at its finest. 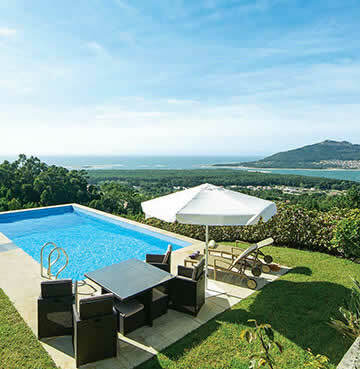 With a villa holiday jostling to reserve a sunbed or fighting to get into the pool is a thing of the past. Here's our top picks for villas with pools in Portugal. The Algarve is Portugal's premier destination. All across the region is an abundance of beautiful beaches, clear electric blue waters, soft golden sands and a warm, welcoming atmosphere. Arriving here and laying under the hot Mediterranean sun should be enjoyed thoroughly, but the region is so much more than just beach after beach. There are plenty of hidden gems to discover from secret coves to towns overflowing with rural charm, and out villas are the perfect base to explore from. 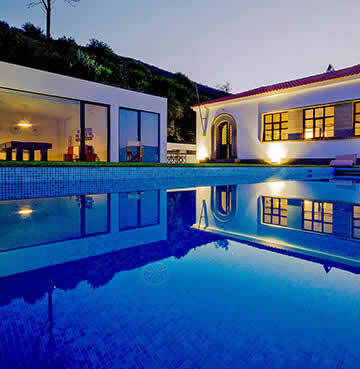 Villa Casa Carmen is set amongst the peaceful countryside of the Caramujeira area. The beauty of this villa is that it's perfectly situated, close enough to the action that you won't miss out, yet far enough away for some peace and quiet. With wide open gardens sheltered by pine woodlands you'll experience a soothing sun trap, topping up your tan or taking a dip in the cooling pool enjoying the quiet solace of your natural surroundings. Want to be in the heart of the action? Villa Rhoda is nestled just 50 meters away from the beach and is only a stone's throw from Albufeira. A sleek and stylish town house with modern furnishings, lounging by the pool is a must with the hot Portuguese sun reflecting off the waters surface. You'll certainly feel like one of the locals, and with such a wonderfully warm and welcoming atmosphere – you'll feel right at home. Nestled in the Atlantic Ocean, just off the Moroccan coast, this volcanic piece of paradise is filled to the brim with natural beauty and stunning scenery. All across the island you will come across one nature park after another, preserving the raw beauty of nature's handiwork. As if all that wasn't enough, year round sunshine and balmy climes bless Madeira's shores making it a perfect location for a villa holiday. Making the most of those spectacular sea views is the Villa Azul Mar. . 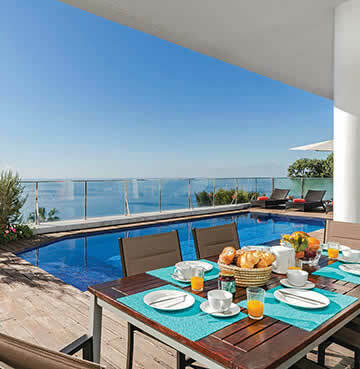 This beautifully furnished villa is sleek, modern and stylish with spectacular sea views. Located just outside the capital of Funchal it's perfectly situated for those looking to explore the island while being close to popular nightlife hotspots. Every aspect of Villa Azul Mar has been designed with comfort and style in mind, which is why the pool looks out over the serene blue waters of the Atlantic ocean, whilst perfectly placed to capture as much of the sun throughout the day. Nestled away in the north of Portugal is Costa Verde, a beautiful verdant stretch of coast and countryside. The contrast between long stretches of fine ivory sand and rich emerald forests makes this one of the most aesthetically beautiful locations in Portugal. A region where you can do it all, from tackling Atlantic surf, blissfully walk through countryside or sample the finest wines the country has to offer. Villa Oceano views are truly incredible. It's not often the view from a pool looks onto a completely different country! Positioned on the northern tip of the Costa Verde, the villa is only a short drive away from the quaint town of Caminha and the beach. Enjoying an elevated position it looks out over the river Minho that acts as a natural border with Spain, and with nothing to block your view you can easily bronze yourself in the beautiful Portuguese sun. You can always tell a region's quality by how much the locals revere it. Portugal's Silver Coast is that region. The long stretch of coastline looks over the cool waters of the Atlantic, fringed with pristine white sands and beautiful yet rugged scenery. Perfect for those looking for Portugal's famous sun and hospitality, but wanting to keep away from the bustling resorts. With a warm and welcoming atmosphere, the area exudes rustic charm. Not only does it have stunning beaches, but an abundance of activities and culture to suit your every need. Overlooking the Obidos Lagoon, few villas provide such an idyllic setting as Casa Ouro Bem. With views of the stunning lagoon from all living areas, the large terrace and pool area, you won't want to stray too far from the villa! For those that do, there's a pathway from the bottom of the garden which leads to the lagoon itself. Stylish throughout with modern stylings, this is a villa that has a little bit of everything you could ask for. The Duoro River cuts through the valley and creates a dynamic and dramatic landscape. Steep rolling hills laced with terraced vineyards means this is Portugal's wine capital. The natural beauty of this region is perfect for those wanting a quiet countryside retreat, away from the hustle and bustle of the coast. At the river's mouth is Portugal second city, Porto. A wonderful mix of tradition and modernity, the winding streets are bursting with culture and fine food. Comfort and tranquillity are what comes to mind when we think of the Villa Casa da Escola. Converted from an old school house, this lovingly restored villa is perched overlooking the lush rolling hills and verdant valleys of the Duoro region. With a terrace that stretches across the property and a pool that overlooks the beautiful vineyards below, it's a small slice of serenity if ever you needed an excuse.